Hi folks, Doc here. 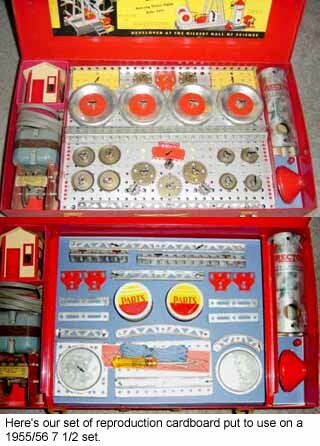 Many of you, including yours truly, are restoring metal construction sets these days. 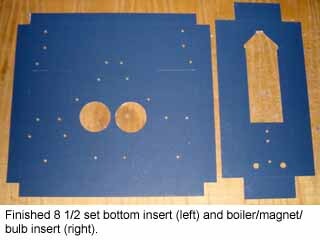 If you are a Gilbert Erector collector/restorer, you need a set of cardboard inserts in order to do the job correctly. Of course, originals are difficult to come by and are often in terrible condition when you do find them. However, the inserts and part boxes are not difficult to reproduce yourself using readily available materials. My friend Bruce was kind enough to document the process for us, so read on and enjoy. And, do take a crack at it - I have done it myself on numerous occasions, and I keep the tools and a supply of the most common materials on hand at all times just in case. One appealing feature of Erector sets is how nice they look when organized as shipped from the factory. Properly organized sets don't facilitate building models, but they do make for a nice display! When the MN 12" baseplate was introduced in 1935 it often became the top tray for displaying parts. 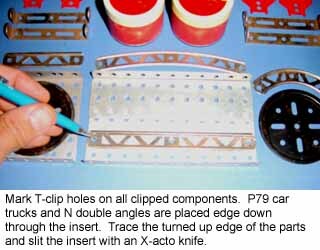 Parts were secured with T-clips (available from Pandys or Joel Perlin). The top trays were lifted off support straps welded to the boxes (not present in cardboard boxed sets and a few metal boxed sets) to access the bottom insert. Parts were also clipped to the cardboard insert. Any left over parts (typically axles, screwdriver, nut holder, etc.) were wrapped in brown paper and placed under the bottom insert or in the boiler if present. Many of the cardboard inserts were Christmas day casualties. However, reproduction inserts are available from a few sources; the best known is Brian Johnson (see www.ACGHS.org, heritage exchange for his address). Another option is to make them yourself. This tutorial describes a way to make box inserts. Insert colors were Buff (#8103) in color in 1935. They changed to Dark Blue (#8473) around 1950. The change to Blue (#8105) occurred sometime between 1955 and '56. Lastly, they changed back to Dark Blue (#8473) color from 1959 - '62. Some sets had other colors as noted above in 1958. Cut the matte board to fit your set box. Bottom inserts had an "apron" around the main insert that folded down (generally down; see table above) to provide room for the paper wrapped parts to fit under. 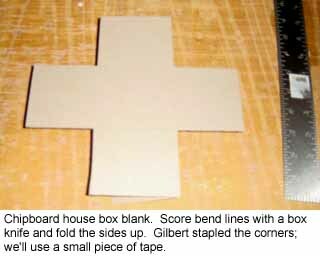 Score the matte board with a box knife to form the "flap". For "Down" aprons, score the top surface, score the bottom for "Up" aprons. The example here is for a 1955 - 57 7 ½ set. 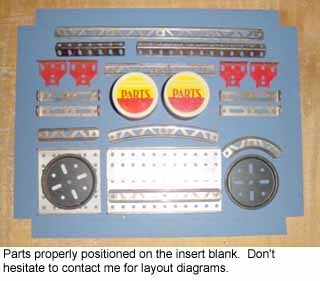 The next step is to lay the parts on the blank per the original set layout. One source is back issues of the A. C. Gilbert Heritage Society newsletter. Back issues are available for $3 each (see Dr. Prune's links for the ACGHS site). Klon Smith (see the ACGHS site under Heritage Exchange) is publishing a book of all sets layouts from 1935-62. Mark the center of the T-clip holes with a pencil. For parts cans, trace around the perimeter. Some sets had the NI clear bulb and/or P12N667 red bulb mounted to display cardboard. 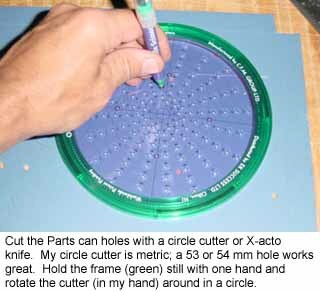 Mark the center point with a pencil and draw a 5/16" diameter circle with a circle template. For CS boxes (9 ½, 10 ½, 12 ½ sets), trace around the boxes. 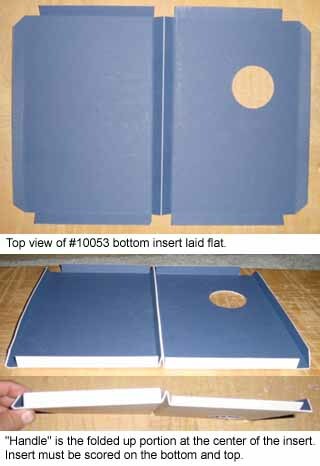 Originals have supporting "flaps" that fold down on the long sides of the box to add support to the insert. 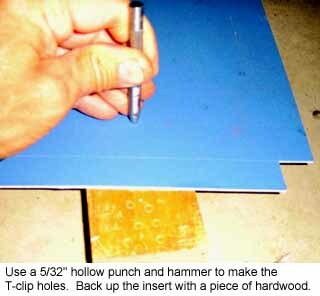 Once the pencil marks are complete, set the matte board on a piece of hardwood and punch the T-clip holes with the 5/32" hollow punch/hammer. 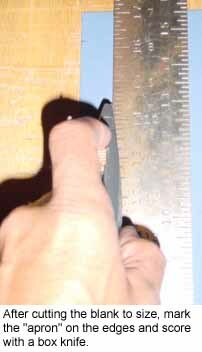 Another method is to pierce the matte board with a sharp screwdriver. 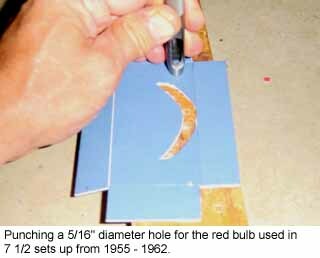 Use a 5/16" punch for the bulb holes if present. 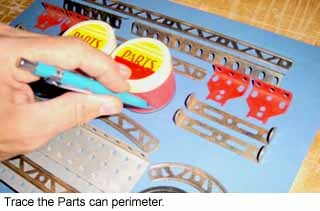 The parts can traces can be cut with an X-acto knife. 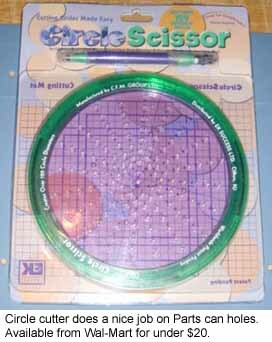 I use a product called "Circle Scissor" for quicker, cleaner holes. That's it for the bottom insert. Here's the final result and some other examples. By the way, in 1959 bottom inserts with "handles" in the middle were introduced in some sets. The handle was a flap of display cardboard folded up and back down on itself. The parts under the insert (if present) were accessed by lifting up on the handle to remove the insert. The parts were in plastic bags and placed on top of the insert. 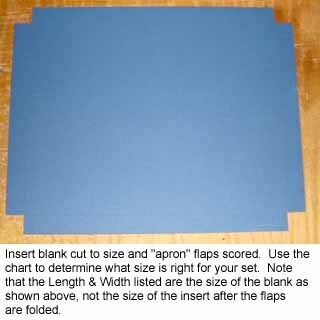 The table below should be used in conjunction with the blank sizes above to make these inserts. The "Bottom" is the dimension of the insert when placed in the box (top to bottom on the #10073/4/221, left to right on the others). The "handle" will be squeezed closed and the aprons up for this dimension. The "Handle" dimension is the height of the handle. "Orientation" describes which direction the handle ran in the box. The "Strip" is the width of cardboard "hoops" placed under the bottom insert to raise it from the bottom of the box. #10053 12 ¾" 5/8" Up/down 1"
A number of sets used boxes for houses, CS's and display trays. Here's a way to make those. 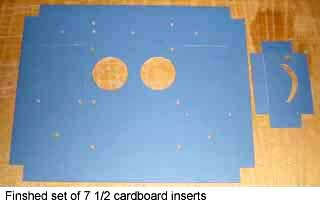 Using chipboard (backing for notepads, available from print shops) cut the blank to size and score the fold lines with a box knife. I had to special order the correct thickness (about 0.050") material. An alternative is to glue two pieces of readily available 0.025" stock together with spray adhesive. In our example we'll make an MX house box. 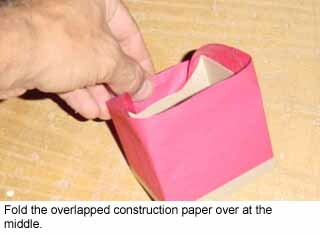 Fold the sides up and hold them in place with a small piece of scotch tape or packing tape. 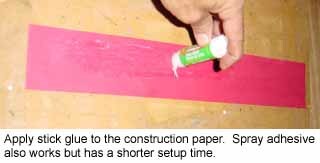 Cut a strip of red or blue construction paper to the appropriate width. 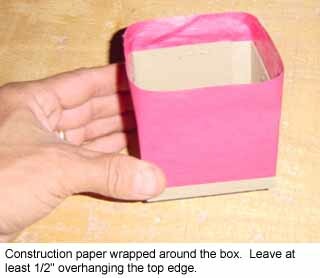 Apply spray adhesive or glue stick (I prefer the glue stick, it has a longer set up time) and wrap the construction paper around the box. Let at least ½" overhang the top of the box. Wrap the overlang into the inside of the box and smooth out the corners with a scale or carpenter's square. Here are the dimensions for a number of different boxes. That's all there is to it. There were many other sets with sizes not listed here. 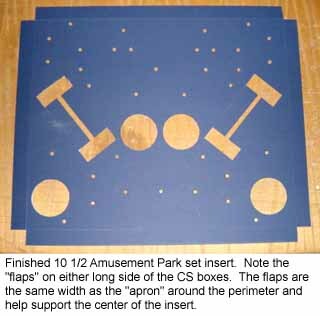 My advice is study the layout diagram and experiment with posterboard or chipboard. I purchased 11" x 17" chipboard for $0.10 a sheet as opposed to $12.95 for a sheet of matte board 26" x 40". I made plenty of mistakes developing hole sizes for rockets and boiler tops and found the chipboard experimentation to be a little easier on the wallet. As always, don't hesitate to contact me with any questions.